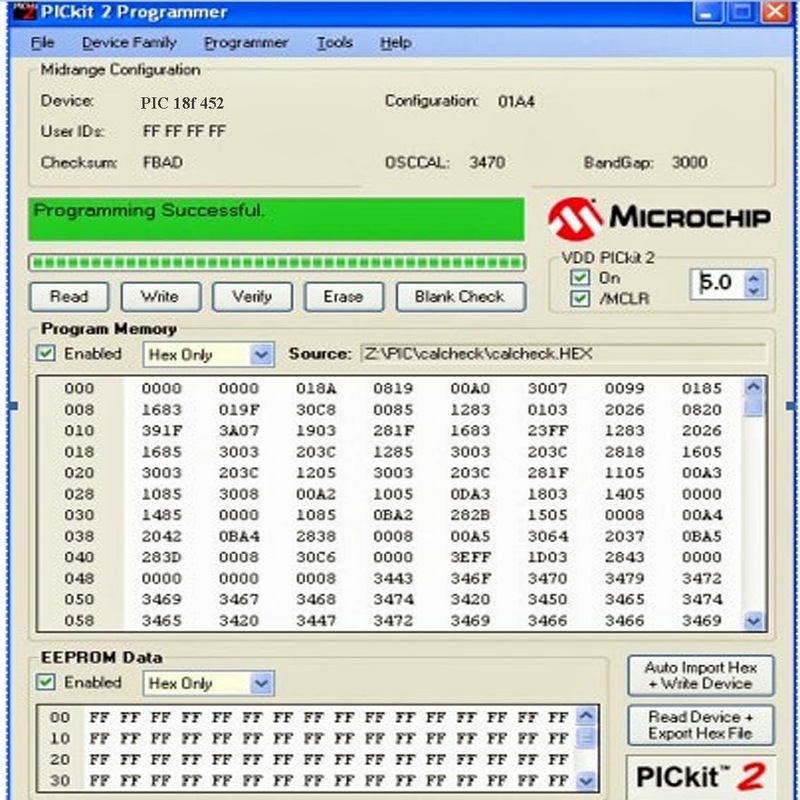 Soon we are going to start our project making, before we start we need to know how we burn or program PIC microcontroller using Pickit2. What is this Pickit 2? 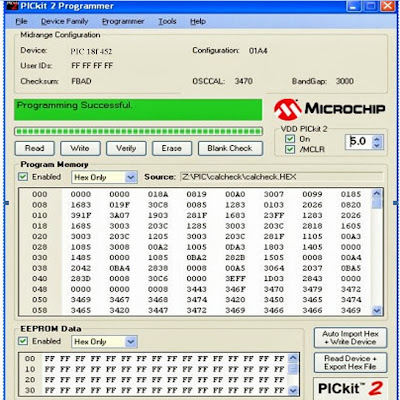 If we want to write data to our memory cards we use card reader/write, if we want to burn our CD/DVD we use CD/DVD writer, in the same way if we want to store our program (burn or program) into the microcontroller we use pickit2 or pickit3. In general they are called as 'Burners' or 'Programmers'. 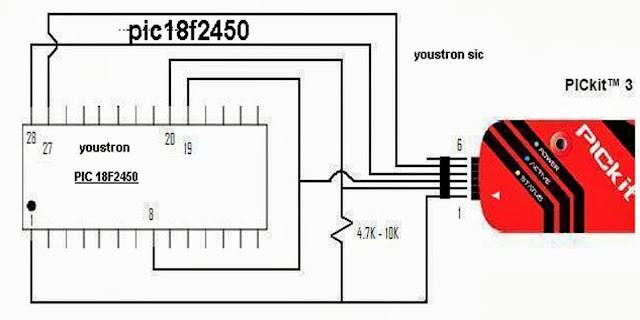 If we want to program 8051 microcontroller then we use corresponding programmer similarly we need to select burner depends on the microcontroller we use. As we are going to use PIC 18f we are using Pickit2. 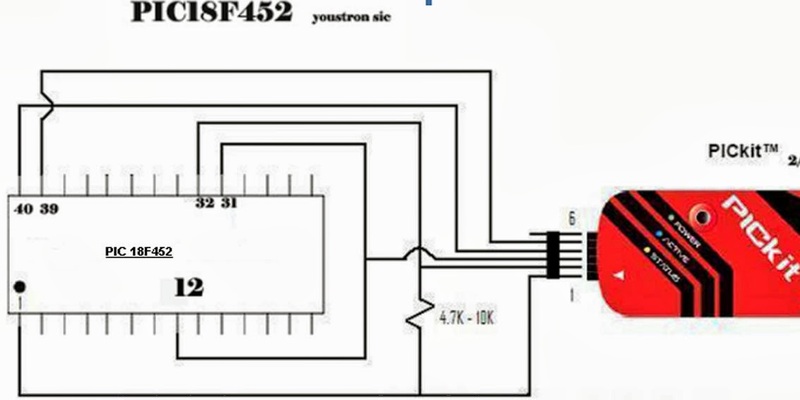 When i was beginner in this field of project making, i was unable to find the correct direction or source to program or burn a microcontroller. 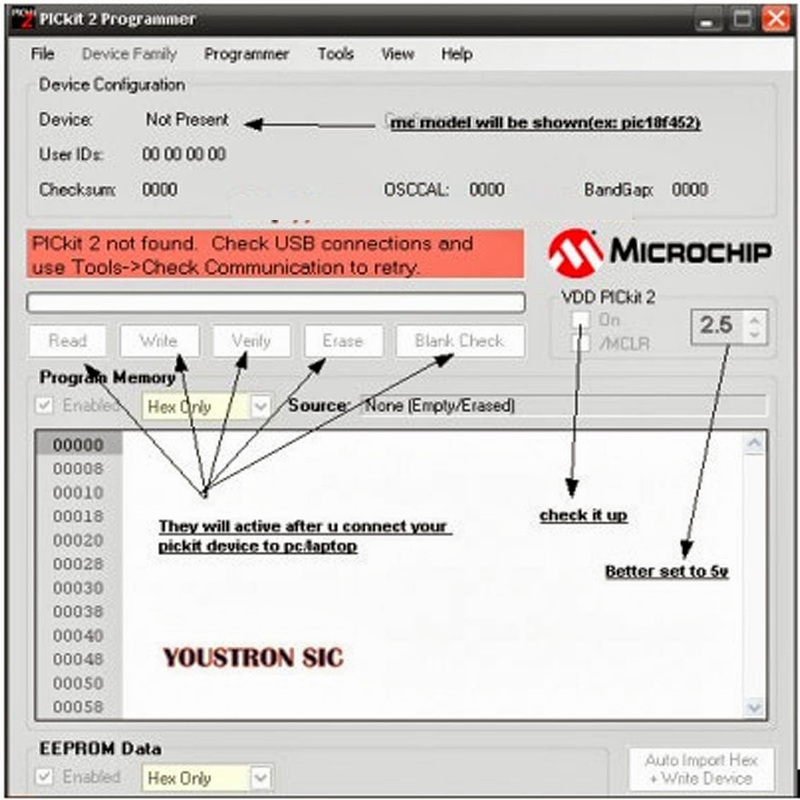 This post clearly explains you how to write a program, how to burn into the microcontroller. I'm using PIC 18f452 and 'pickit2/3' to demonstrate but all the steps are quite common for all other models too. Is it different to program for different compilers ? Answer is yes, but differ in least , the basic C programming is the same but if you are including library functions then you need to know what are the library functions offering by that particular compiler, check the 'help' section of your compiler to know all the library functions. After compiling various files will be generated, but we only concern with the file with extension .hex , because we burn or load this file into our microcontroller. How to know whether our code works fine or not, so its better to check it though various simulating software's. One of the famous simulating software is PROTEUS ISIS. You will get lots of tutorials online. After verifying our code though simulators, next step is to burn it into our microcontroller. I'm using pickit2 tool for burning or programming, follow the below steps. >> Install pickit2/3 software on to your pc/laptop. Wire the above connections onto your bread board and connect it with pickit2/3 and connect your device to your pc/laptop. Imp Note: If you are using any other microcontroller other than pic18f452 then first check the "pic18f452 pin diagram" and corresponding to it find out the pin numbers of your microcontroller model and connect it as shown above. 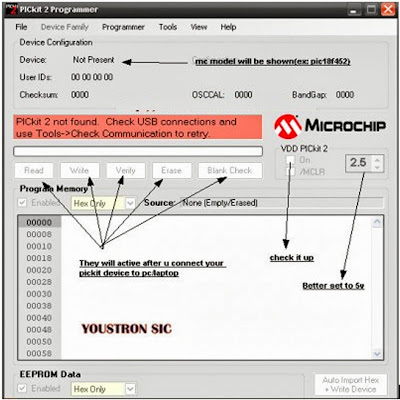 >>Be sure to check whether your microcontroller model number is showing at top right corner beside "Device:" or not. >> 'Check' (tick) the 'on' power , better to maintain 5v. >> 'Read' , 'Write', 'Verify' , 'Erase', will be active after your connections are made good. >> Now, click on Read, wait until you processing shown completed. >>Go to file>> Import file>>browse your .hex file location. >>After your import the file successfully, click on 'Write' option. How to copy mcu and how to burn to chip ABOV SOP28? You should also check out Arduino Projects on http://www.TheEngineeringProjects.com/ There are many Arduino Projects there. I would also recommend C programming tutorial along with microprocessor programming. If your fundamental concepts of C programming like data types in C, pointers, array, functions and loops are strong the learning microprocessor programming won't be a big deal.